The Florida Southern was the largest of the big three narrow gauge (36 inch gauge) systems in Florida, with many more miles of track and more equipment than either the South Florida Railroad or the Orange Belt Railway. It was built and motivated by compromise and gentlemen agreements as it snaked its way south from Palatka towards Charlotte Harbor beating its longer lived competitor, the Florida Central & Peninsular Railway to large amounts of land grants. But a road that calls itself the Orange Belt Route did live and died by that fragile citrus fruit. 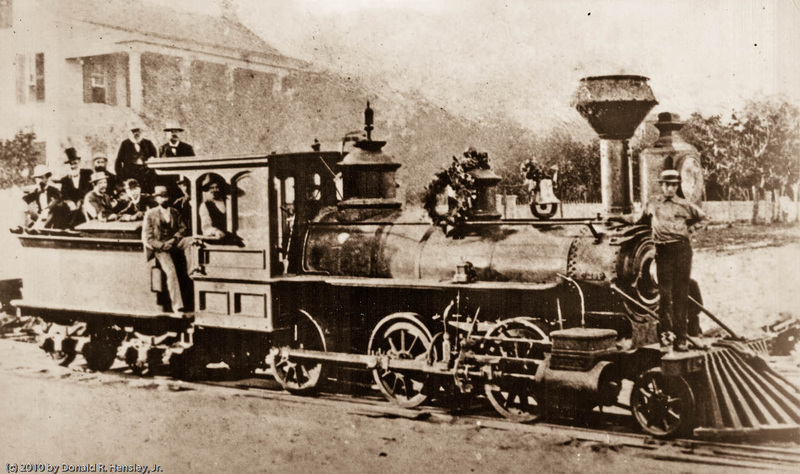 One of Florida Southern's first locomotives at Gainesville, Florida in 1881. This is said to be number 2 and was one of the Brooks Moguls purchased from the Emmelton & Shippensville Railroad in Pennsylvania. University of Florida. 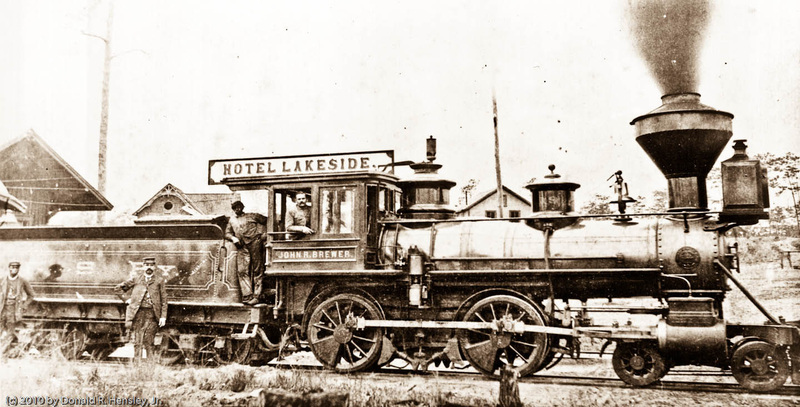 The Florida Southern (FS) started its history by the name of the Gainesville, Ocala & Charlotte Harbor Railroad on March 4, 1879 with a route from Lake City to Charlotte Harbor with a branch to Palatka. Construction began in January of 1881 at Palatka, as the branch line to this deep water port city was deemed the most important, as most of the construction materials would come by sea. 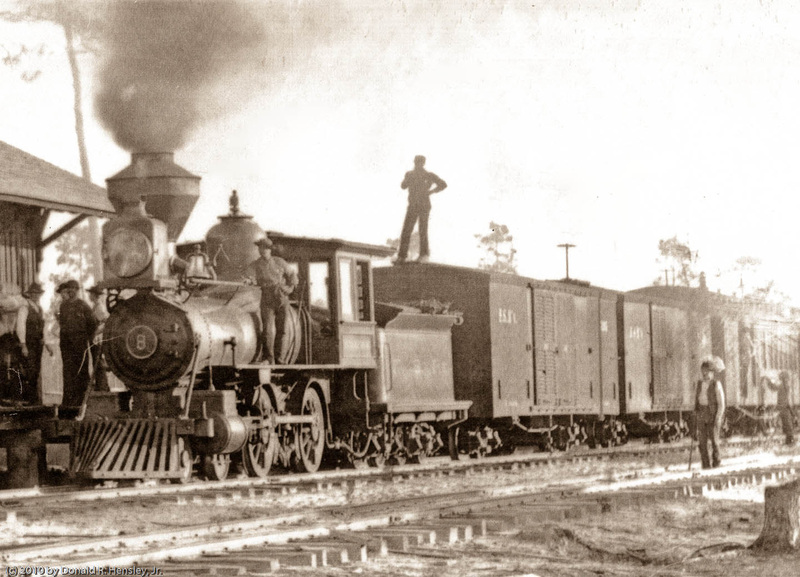 A directors meeting in February of 1881 changed the name of the railroad to the Florida Southern Railway. The iron for the branch arrived in March and track laying began at Palatka, finishing sometime in mid August in Gainesville. However the frog for the crossing of the Atlantic Gulf & West India Transit Co.’s (AG&WIT) tracks did not arrive until September. 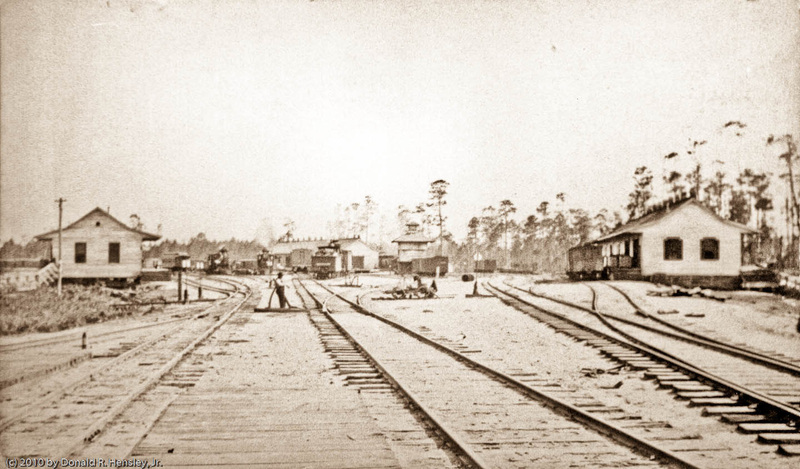 Regular train service on the 55 mile line between Palatka and Gainesville began by August 21, 1881, which was marked by a timetable published in the Jacksonville Times. The FS wasted no time in building their mainline south and the 32 miles Perry to Ocala was soon constructed by the Winter of 1881, where they again crossed the tracks of the AG&WIT. The first timetable I can find is January 29, 1882. 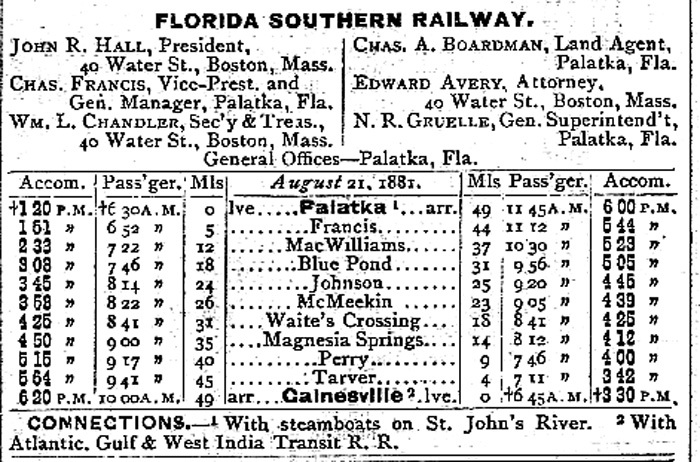 By the July 9, 1882 timetable the road was divided into two divisions, the Palatka and the Ocala with four trains each. Construction South of Ocala proceeded slowly, reaching Leesburg on Lake Harris by November 23, 1883. Branches were quickly built to reach rich agricultural areas of Micanopy Lake Harris and Lake Griffin. This later branch connected with the St. Johns & Lake Eustis (STJ&LE) narrow gauge road that ran from Astor on the St. Johns to Lake Eustis. The FS soon leased the STJ&LE and controlled it for the remainder of its corporate life. Another important branch was the Citra Branch which ran through one of the riches citrus belts in Florida to the town of Citra. Florida Southern # 19 at Lake Weir around 1888, note the Hotel Lakeside behind the engine which indicates that the train is heading North. Below is a photo showing the Lake Weir train depot before the construction of the Hotel. Construction North toward Lake City however, proceeded slowly; by September of 1883 eleven miles had been completed to Hague. At this time Henry Plant was pushing his Live Oak Charlotte Harbor & Tampa Railroad (LOCH&T) south from Live Oak towards Gainesville and he did not want a competing road parallel to his. He had also bought a large stake in the South Florida Railroad which he would soon push towards Tampa. Plant quickly made a hand shake deal that the FS could not refuse and Plant soon owned the unfinished Lake City to Gainesville grade. The Florida Southern was paid handsomely for that right away and they promised not to build north of the AG&WIT tracks, while the LOCH&T agreed not to build south. The FS would be allowed to build to Pemberton’s Ferry on the Withlacoochee River, where it would connect with a branch of the South Florida which would carry their passengers and freight to Bartow, where the FS could begin construction of their Charlotte Harbor branch. In return the South Florida would give up its charter to build a competing line to Charlotte Harbor. Land Grants meant for the FS between Pemberton’s Ferry and Bartow would revert to the SFRR. Pemberton’s Ferry was reached by the end of 1885, but the small town was not suitable for a terminal so the road pushed west ten more miles to the more larger town of Brooksville. 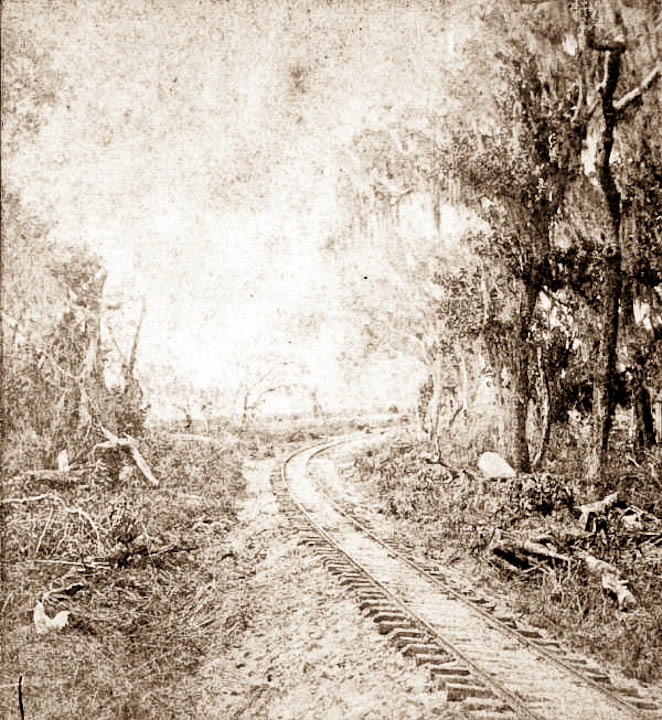 The SF had built their connection line in September of 1885 but the FS had already leaped to Bartow in May to begin location work southward to Charlotte Harbor. That fall construction began towards Arcadia, reaching the little village in March of 1886 and to the terminal of Trabue where the first through train ran on July 24, 1886. The terminal was soon called Punta Gorda. The Florida Southern was finished at 299 miles of track, making it the largest narrow gauge system in Florida. It also acquired 2.7 million acres of land grants from the Florida’s Internal Improvement Fund, making it the largest land grant in Florida. Around 1890 the road was leased to the Jacksonville Tampa & Key West and operated as part of the Tropical Trunk Line. Florida Southern Ry locomotive # 8, a rare Rhode Island built narrow gauge engine ordered with out the sand dome. The sander was located in the small box under the running board. This train is on the Charlotte Harbor Division at Arcadia, FL around 1888. Note the two ventilated box cars. The Florida Southern Railway went into receivership on March 19, 1890 and when it emerged in 1892 it was reorganized as the Florida Southern Railroad with Henry Plant listed as one of the directors. 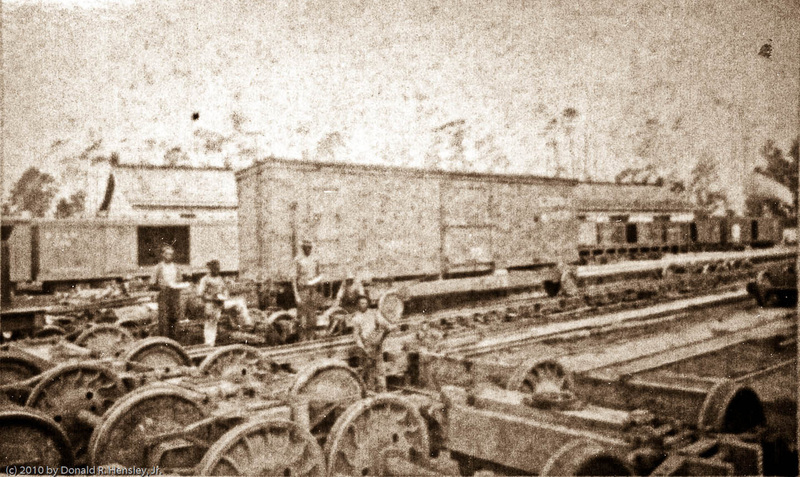 The Charlotte Harbor division had a separate bond issue and operated on its own during the receivership, standard gauging its line in 1891 and purchasing its own standard gauge locomotives. A severe freeze in 1895 destroyed the Citrus industry in North & Central Florida which in turn forced the stockholders and bondholder to pass control of the Florida Southern to the Plant System on January 1st, 1896. Plant standard gauged the railroad on July 11, 1896 and coordinated operations with the rest of the Plant System. The equipment was stored in Gainesville and Palatka and the best was put up for sale. Most of the locomotives were sold to the lumber industries through out the Southeast. 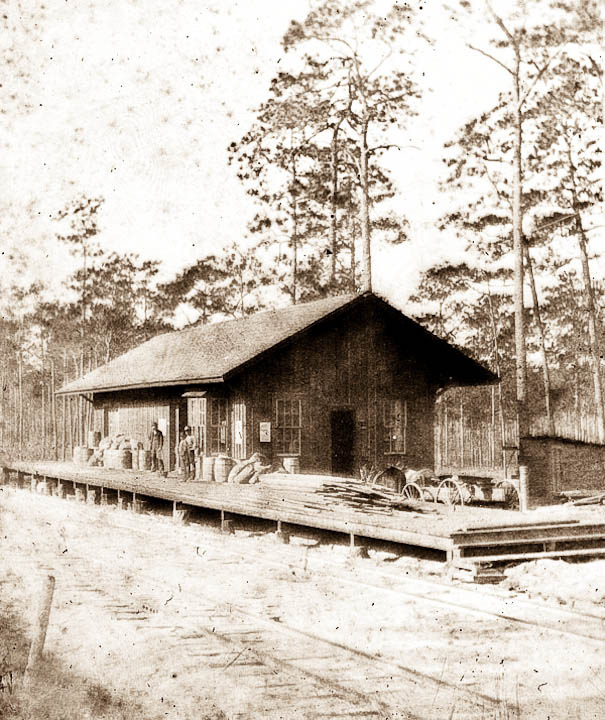 The Florida Southern’ facilities in Palatka included a roundhouse, machine and car shops as well as a company offices and wharf for connecting with the commerce of the St. Johns River. The turntable had to be an above ground type due to the high water table so close to the river. Click here for some Palatka Sanborn Maps showing trackage and buildings. In Gainesville the FS had retreated from the town, with the LOCH&T taking over and running down West Main Street, the main depot for both roads was located near the AG&WIT (later the Florida Railway & Navigation and then the Florida Central & Peninsular)crossing and the LOCH&T and the FS shared joint facilities south of the crossing. These included a Ramsey Car Transfer and dual gauge turntable and engine house. Standard gauge cars were raised by the Ramsey method and narrow gauge trucks were installed. The only draw back was that the cars had no brakes, so they had to be strategically placed in the train. A wreck in Ocala was caused by the lack of brakes with these standard gauge cars that were being pulled by one of the roads Grant engines. The FC&P crossing was blocked with their passenger train and the FS switcher could not stop in time with the brake less standard gauge cars pushing the locomotive into the passenger cars, pushing one coach over. An early newspaper reported that the FS and LOCH&T interchanged cars via the Ramsey Transfer, but that practice stopped once the Plant System and the FS became partners in late 1883. The Gainesville yard of both the Florida Southern and the SF&W circa 1886. The narrow gauge tracks of the FS are on the far left while the five foot gauge of the SF&W are on the right. Two narrow gauge locomotives can be seen in the background on the left while a five foot gauge engine is on the center track. The FS freight house is on the far left. The LCL transfer shed is in the middle background while the SF&W freight house is on the right. The joint passenger depot would be in the foreground as the platforms can be seen. Thats a nice looking water tank in the middle. Here the view is from the south, with FS narrow gauge tracks on the right, the mainline on the far right. 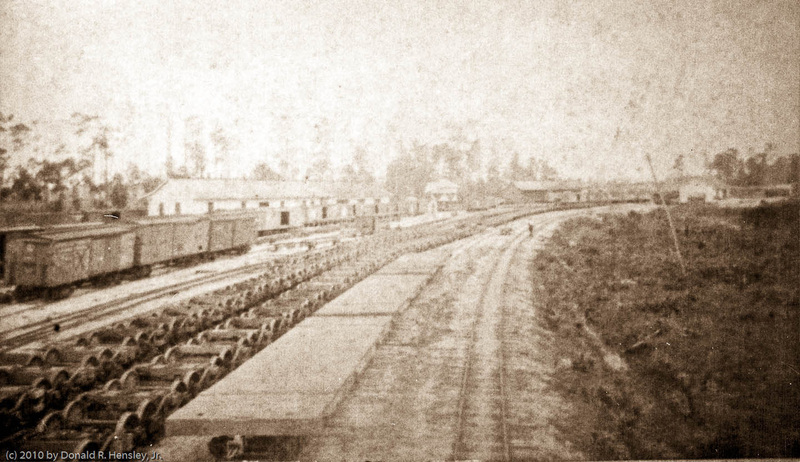 The next siding has narrow gauge flat cars, note the lack of hand brakes wheels, this may have been a safety feature so that the brakemen did not have to climb over loads and up and down ladders to reach the brakes. I would assume that the flats would have been handled in a solid block. The standard gauge to narrow gauge LCL transfer shed is now on the right and the freight house can be seen in the far left back. The FS freight house is on the far back right. Unfortunately the joint passenger depot is hidden behind the freight depot though I think I can spy a small part of it on the right. In the middle of the photo, about even with the nearest SF&W freight house is the Ramsey Transfer. Here is the Ramsey Transfer at work, the men have raised the car up using the rolling device which run on its own narrow gauge track (about one foot gauge) on both sides of a dual gauge track, five foot and three foot. The standard gauge trucks stay on the track, they are rolled off and put on one of the truck storage tracks. Narrow gauge trucks are then rolled under the car and the body lowered back down , one side at a time, and when finished the switch engine would move the car to the appropriate track.